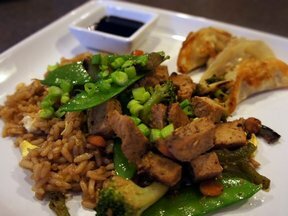 Create your own Asian meal in your house with this delicious stir fry. Whether you like it over rice or noodles, this dish will please everyone. Serve it with some potstickers to complete the meal. Brown meat in oil; remove from pan and set aside. Add vegetables to pan and cook about 3 minutes or until softened. Combine remaining ingredients and add to pan. Add meat and cook until sauce is thickened.